If you have been following me on Instagram or you're my Facebook friend then you more than likely already read my announcement on Friday. 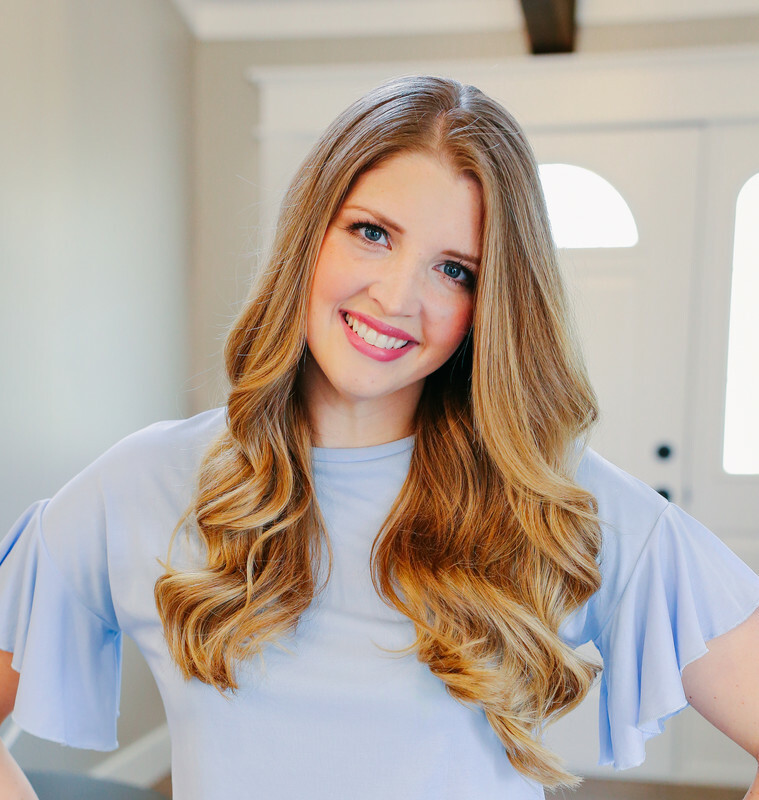 If you are one of the people who missed it, then long story short... Last Fall I was privileged to meet Julia, the owner of my favorite boutique, Lace & Lilac. We struck up a friendship and began working on something I have dreamed of for a long time... an exclusive collection of modest, feminine clothing hand picked by me to reflect my personal style and taste. It has been a dream working with Lace & Lilac to bring it to life. The day is finally here, and today I am SO happy to finally launch my "Classically Courtney Collection" RIGHT NOW! The collection includes three feminine dresses and two dainty tops. Below you will see detailed photos of each clothing item along with a link to shop each piece. I am also reviewing the sizing for those of you who are skeptical of shopping online! Lace & Lilac has also included exact measurements of each item on their site. Now, for the ladies who want to get straight to shopping (or gentlemen who like to shop for their ladies 😉) you can CLICK HERE TO SHOP THE ENTIRE COLLECTION. This dress is one of my absolute favorite pieces in the collection. It has a soft blush pink color in a linen fabric with button front detail. The skirt is double lined so no need for layering or slips! 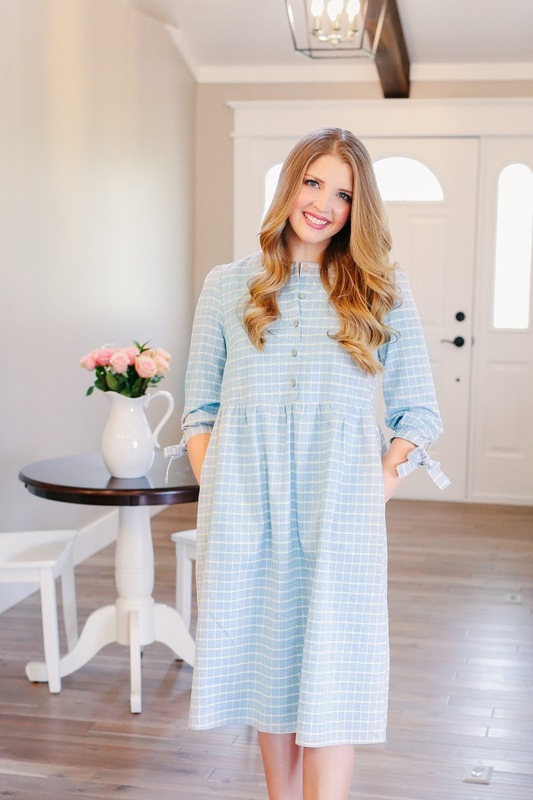 For the nursing mamas out there this dress is perfect! The buttons are REAL, which makes it a functional dress for church, and special events, etc. I'm 5'6" and it falls just below the knee. I normally wear a size small or size 6 dress. I found that this dress ran a little on the smaller side... I'm wearing the medium so the bust wouldn't be too tight. The waist is elastic in the back (pictured below) so it gives you plenty of room. I think the medium fits like a 6-8. If you follow me on Instagram then you have probably have seen me mix and match embellished tees over and over in my everyday outfits... So, I thought it only seemed right to include a tee in my collection. 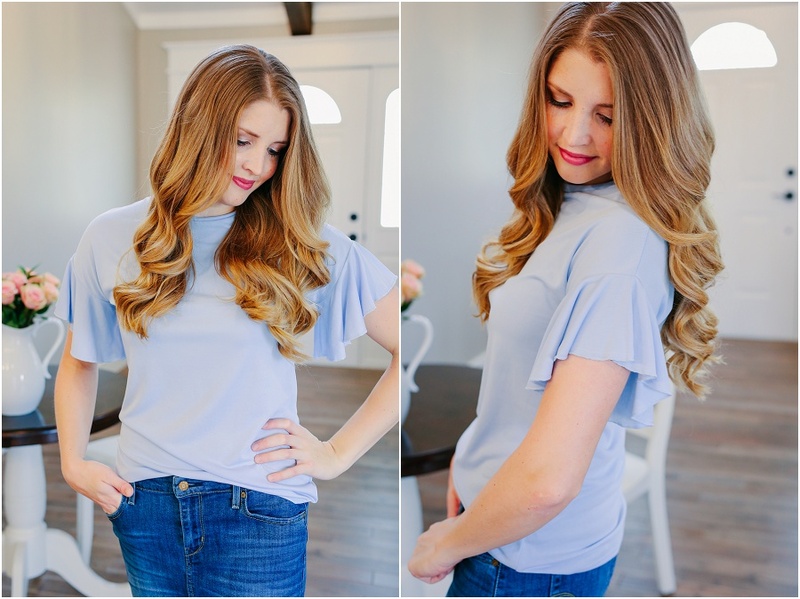 This ruffle sleeve, light blue tee fits true to size and is the most amazing soft stretchy, silky material. It could easily be dressed up with a lace skirt and heels or worn with a denim skirt as pictured here. I'm wearing the small. 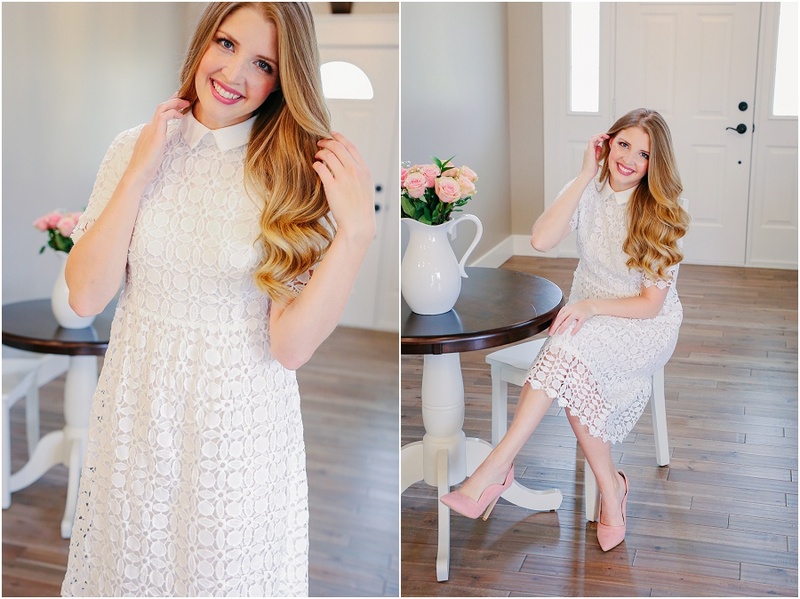 The lady in white dress is the perfect blend of class and sophistication. The fabric is a pure white stretchy lace with a white knit underlay. The fit is very flattering since it comes in at the waist and then flairs out at the hip. The collar is such a pretty detail, and even though the dress is lace it is surprisingly comfortable! I'm normally a small or size 6 and I'm wearing medium here (once again to keep the bust from being too tight. I had plenty of room in the waist. I think it fits like a size 6-8. I'm 5'6" and the knit underlay comes to the knee and the lace overlay falls around 3" below my knee. I also love that the sleeves are lined as well. 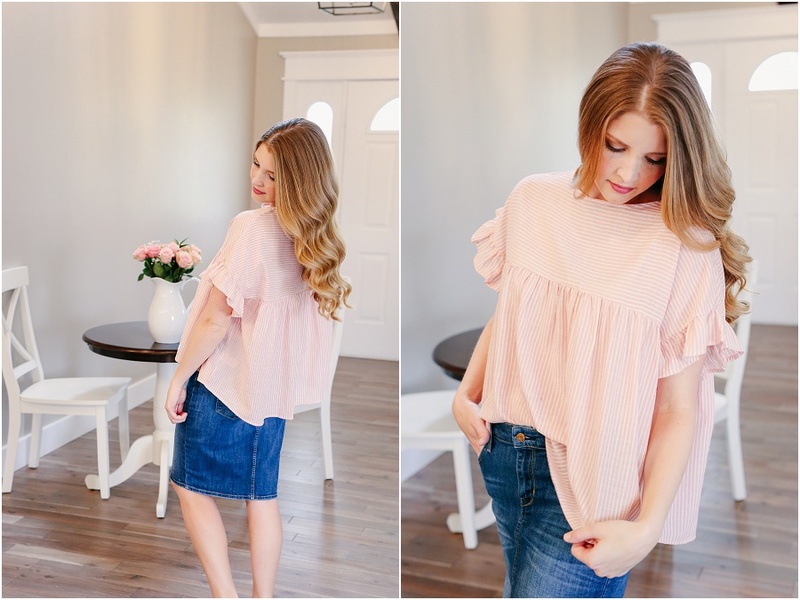 Blush pink, pinstripes, ruffle sleeves... What more could you want in a top? Perfect for brunch with your lady friends or to spice up an everyday outfit. The material is light linen, so it's nice and cool for summer days. It has a very loose baby doll fit so I definitely recommend sizing down if you are unsure of your size. I'm wearing the small and have plenty of room. I love the feeling of not being restricted in this top, and also love that the top is longer in the back. So comfy and cute! 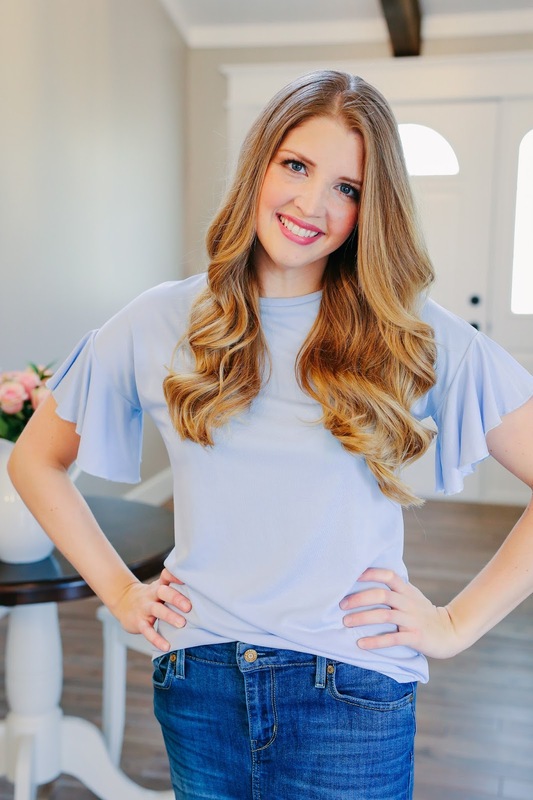 My favorite feature on the Color Me Blue dress is the pockets! I love a dress with pockets, and with the loose fit on this dress you really can hide your cell phone or chapstick, and no one will know! The fabric is a cotton type fabric and it's double lined, so once again no need for layering or slips! The buttons are also real on this dress so another winner for my nursing mama friends! It has a generous fit. I'm wearing the small and I would say it runs true to size in the bust and more generous in the waist. The small fits like a 6-8. This is my personal favorite type of dress for comfort. The ties on the sleeves are also a super cute detail. I'm 5'6" and the dress falls a few inches below the knee. I want to say a huge thank to each and every one of you for following along with me on social media. This collection wouldn't have been possible without you! <3 I appreciate your support and encouragement more than you know! Also, many thanks to Julia of Lace & Lilac for taking care of all the details to bring this collection alive! Happy Shopping! God bless your adventure. It is much needed. What an amazing accomplishment! The collection is just beautiful! Question: is this a one time thing, or will y'all be doing more collaborations in the future? These selections are gorgeous! I especially love the white dress. Great job, Courtney!